In the wake of the EcoChic Design Award 2015/16 finale, we caught up with last year’s winner Kévin Germanier. The 2014/15 cycle victor talked to us about his exclusive upcoming collection for Shanghai Tang, as well as his experiences of working with sustainable materials in a commercial environment. 1. 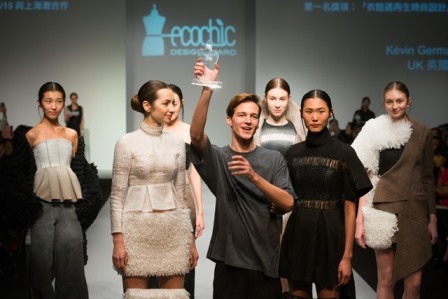 As the winner of the 2014-15 EcoChic Design Award, you got the opportunity to design a completely sustainable collection for China’s leading luxury brand, Shanghai Tang. What are your most memorable moments from the whole experience? It was an emotional moment to see the final collection finished, having worked on the full-lifecycle and knowing it will soon be in retail stores. Being here in Hong Kong I’ve met and been inspired by highly-esteemed people from all over the world in the fashion industry. Learning from their experiences has been invaluable for my future career. 2. Has working at Shanghai Tang changed your approach to sustainable design? Working in a professional environment really taught me how to pull a collection together for retail, and not just the one-off pieces I’ve previously made as a student. My experience changed the way I look at design. It’s so important to understand the market and your customers; knowing what they want rather than designing what you want! Working with luxury surplus fabrics has also been amazingly creative, yet challenging at times. For example, I fell in love with some fabrics that I would have liked to have used more of but there wasn’t enough, so flexibility and creativity are needed for up-cycling design. 3. In what ways were you able to develop your skills as a sustainability-conscious designer? As a student, there isn’t a requirement to think commercially in terms of pricing, buying and production, it’s more about developing your creativity. In my time at Shanghai Tang, I had a very hands-on experience in all areas of production and was also responsible for buying, which made me a lot more conscious with regards to sustainability in a commercial environment. 4. We spotted Founder and CEO of Redress Christina Dean wearing one of your pieces to this year’s show. Tell us a little more about your Shanghai Tang collection. What inspired you? I was fortunate to have access to the iconic Shanghai Tang archives which really inspired me. The challenge of using limited ‘waste’ fabrics and incorporating them into a capsule collection which would complement the main collection was very interesting. I think my capsule collection retains the elegance and history of the brand whilst having an edgy, graphic and contemporary feel. 5. 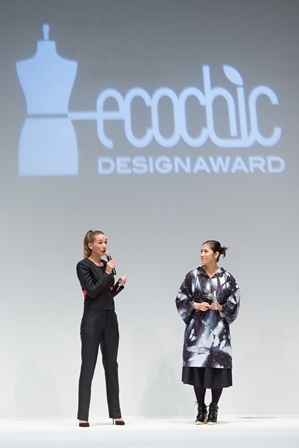 You were a student when you were crowned the 14/15 winner; in what ways did the EcoChic Design Award develop you as a designer? The EcoChic Design Award helped to develop my knowledge about sustainability in design and I also learnt how to deal with my stress levels and to present a collection to an international jury of experts. In particular, being with other finalists for a week in Hong Kong for the final developed my interest in new technics as we had lots of discussions and experience sharing. The competition also definitely developed my personal style, I honed in on what I wanted to design and the kind of woman that I want wearing my clothes. 6. Now that you’ve completed your collection for Shanghai Tang, what’s next for you? I will complete a 6 month internship at Louis Vuitton in Paris before heading back to finish my final year at Central St Martins in London. 7. Finally, what advice would you give to student designers who want to learn more about sustainable fashion? 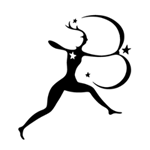 Be creative and imaginative, be yourself and have fun. Make sure you explore and experiment with sustainable fabrics, as they are the future. Kévin’s upcoming collection will be sold exclusively in Shanghai Tang stores from August 2016. In the meantime, you can keep up-to-date on his latest work by checking out his website and instagram.